Do you believe that each of us has not one, but a thousand gifts to give the world? Do you love art and believe that art is one of those gifts? I want to give you a painting. I want to give you a painting of a sunflower seed. Tall, strong, visually striking, it is a wonder of life to behold as it grows and tracks the sun through the season. I recall my sadness, the first time growing them, at the first frost. I wished I could turn the clock back by one day, for the day before they were in their prime, and the next morning their heads were blackened and drooping, never to look up at the sun again. Life can change just like that. We seem to be in a time now where we wish we could turn back the clock by one day. The sunflower may have only one life for itself, but it carries a thousand seeds, a thousand gifts of itself. Seeds sent out into the world, planted far and wide in supportive soil will grow into new flowers. Seeds hoarded can do no good. I see so many actions by individuals, giving gifts of themselves to make the world better, whether it be signing a petition, writing a letter, joining a march, making soups for housebound seniors or dolls for hospitalized children. I want to encourage us all to focus on the gifts we have to give, the positive actions we can make, rather than on putting up walls and hoarding what we think we have against those we think are out to take it from us. Visit The Sunflower Project page on my website to find out how you can receive your gift of a sunflower seed painting! May it remind you that you too have a thousand gifts to give the world. May you give them, and may your life grow a thousand fold. Author DebbieleeMiszaniecPosted on January 30, 2017 January 6, 2018 Categories The Sunflower Project, What's the Big Idea? Cowboy Coffee is a painting from my Western series. You can see more here. Painted on a bandana background, it refers to Cowboy culture prior to the invention of barb wire fencing, which led to the fencing off of range land and permanently changed ranching culture in North America. Previously ranching operations ranged freely across much on north america, with herds intermingling. The job of Cowboy was crucial and harsh. Rounding up and herding, sorting and branding cattle on the open range; cowboys lived with the cattle for the season, eating, sleeping and working on the range in makeshift and improvised settings. 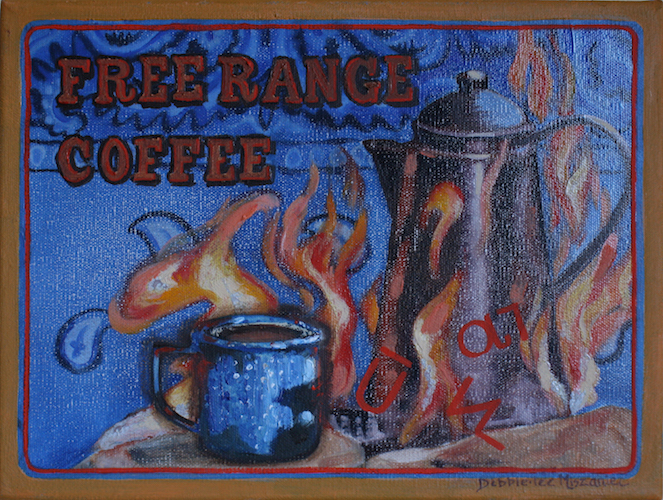 The text of this painting, Free Range Coffee, playfully alludes to both this reality, and to the current desirability of free range ranching practices as part of the ethical treatment of livestock, though it can’t hope to approach the scope of that earlier free range. While branding is seen as a questionable practice for some, it was also an indispensable practice for free range ranching of that era, without which it would have been difficult to maintain an open borders practice while tracking livestock ownership. 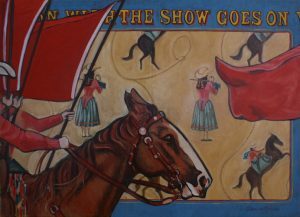 The painting includes three brands (in the flames in front of the coffee pot), belonging to three of the big four founders of the Calgary Exhibition and Stampede. Author DebbieleeMiszaniecPosted on January 27, 2017 January 6, 2018 Categories The Story Behind the Painting, What's the Big Idea? It is an idyllic image of a perfect day at Fish Creek Provincial Park in Calgary Alberta Canada. 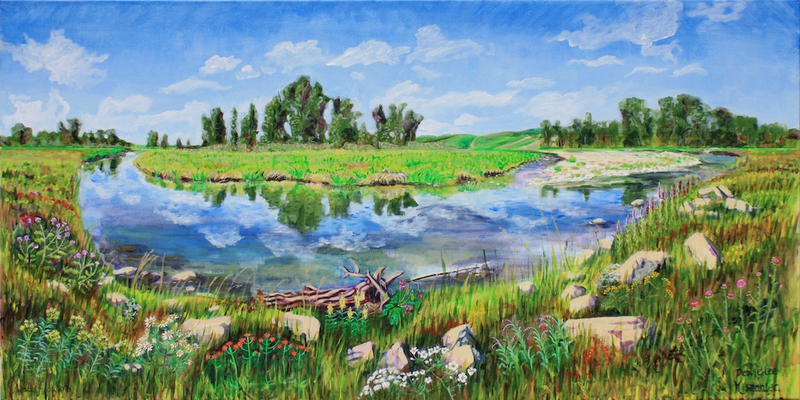 What’s more, it is an encyclopedic painting depicting a range of attractive wildflowers which have been declared invasive species, because their hardiness and vigorous growth habits endanger bio diversity in natural areas by pushing out native plant species. This is a problem because animals and insects who rely on those native plant species as food sources may be adversely affected by their displacement. I created this piece in cooperation with the Friends of Fish Creek Park, as an aesthetic intervention and educational tool. The idea is to educate viewers about invasive species, recognition and control strategies. Educated viewers can get a print of the painting as a resource to keep. The idea is to enjoy the beauty of these invasive species of wildflowers by displaying them on our walls, rather than in our gardens, where they could inadvertently be spread to our parks and natural areas through storm or surface water run off, animal transfer or human disposal. Hence the title of the painting: Wallflowers. 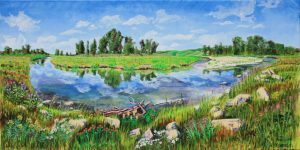 If you would like a print of this work, I would recommend contacting the Friends of Fish Creek Park to find out about the next educational event where the painting will be presented. Either that or watch my newsfeed for announcements of upcoming viewing for this painting. Author DebbieleeMiszaniecPosted on January 23, 2017 January 6, 2018 Categories The Story Behind the Painting, What's the Big Idea? 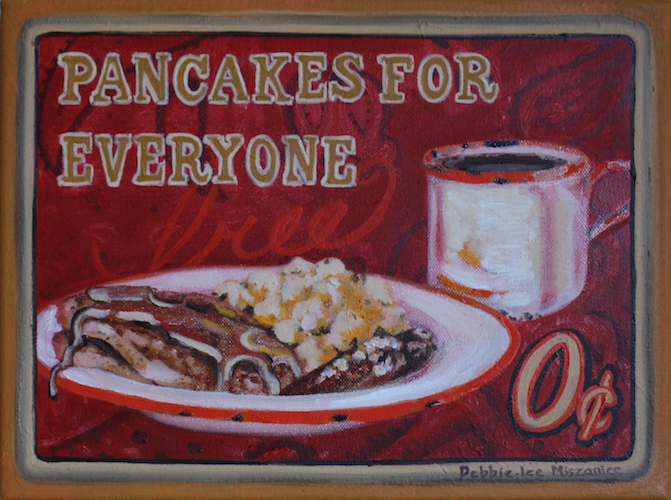 Pancake Breakfast, from my western series, is a fairly straight forward piece. Growing up in Calgary Alberta, one of my favourite traditions of our annual (July) city wide Stampede celebrations are the free pancake breakfasts. For ten days, rich or poor, young or old, if you can line up on a sunny summer morning you can have a great breakfast, and entertainment, and possibly swag, all free of charge. Breakfasts happen all across the city every day during Stampede. Put on by community groups, churches, corporations, politicians, dentists, you name it, they are a great expression of community inclusion and caring. Even if you can’t afford to go to the Stampede grounds more than once, or at all, there is still a plate of pancakes and some country music waiting somewhere for you in this city. Author DebbieleeMiszaniecPosted on January 20, 2017 January 6, 2018 Categories The Story Behind the Painting, What's the Big Idea? 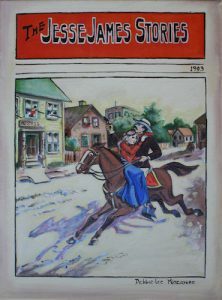 The Dime Novel Paintings are part of my Western Series, which you can see here. They are still life paintings referencing the covers of early 20th century Western themed weekly fiction publications. The West lives as much in the imagination, in hyperbolic stories of legendary skill and courage, as it does in historical fact. We are much nearer to the source of the legends than earlier stories of medieval knights or Greek heroes. We even have photography, which can show us the real faces of some of our legendary figures, should they actually have any base in reality. Yet this vision of the west does not always line up well with historical accounts. Jesse James, for instance, was not a hero or a Robin Hood figure. Rather today many of his actions might be war crimes. I find theses covers interesting to observe in the way painting something forces you to observe and think about it. I appreciate them not only for their aesthetic qualities, but for their perspective on a west that was already skewed toward legend and myth despite being nearer to the events pictured than we are now. I also find them interesting from a socio-historical perspective. Like watching movies about the future that were made a generation before the current time, it often tells us more about the writer’s concerns and worldview as a member of his or her time than it does of the time being written about. Author DebbieleeMiszaniecPosted on January 16, 2017 January 6, 2018 Categories The Story Behind the Painting, What's the Big Idea? Hi there again, and happy Friday the 13th! Hopefully you all ate your Lucky Charms cereal this morning, and don’t have any work to do under tall ladders or anything. 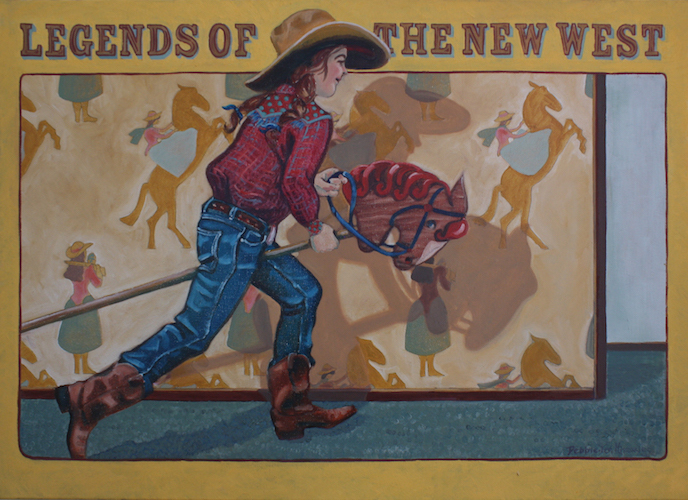 Following Legends is the second of two paintings thinking about female western legend Annie Oakley. The legend of Annie Oakley forms the backdrop, the wall paper, to the life of the little girl from Wild Roses (last week). The little girl grows up and perhaps becomes one of the flag bearers at the Calgary Stampede, our equivalent to Buffalo Bill’s Wild West Show. 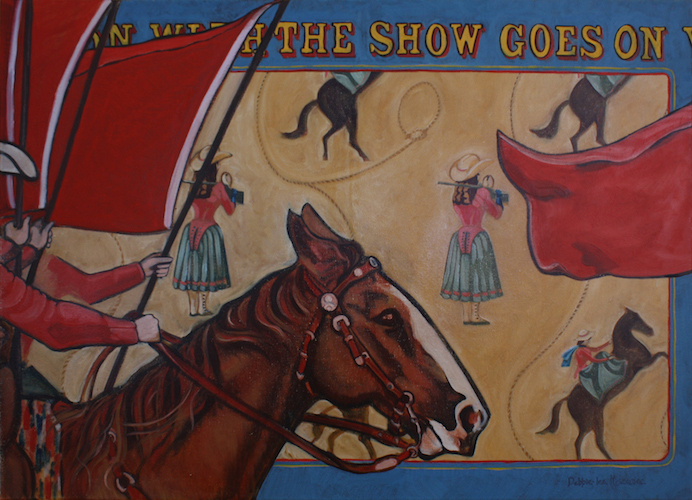 And so “the show goes on”, and “on with the show” as the text at the top of the painting mentions. Author DebbieleeMiszaniecPosted on January 13, 2017 January 6, 2018 Categories The Story Behind the Painting, What's the Big Idea? I have just added a new western art gallery to my website. Included in the gallery is the painting featured in my last post, and I will be talking about some of the others more in depth as we go along. The images are not super high quality yet, the captions are short, and the design does not line up with the other galleries either, but it is there. Adding it required changes to all of the other pages, and will also require further changes, but one could spend all week on updating and never get into the studio! The other side of my new years resolution is spending the afternoon in the studio, so what it is really about is achieving balance between office and studio so I am neither binging on one nor neglecting the other. So, even though it is super difficult to break focus and move to another task, that is it for website stuff today. This afternoon I will be working on a still life painting of fruitcake. In the mean time, take a quick peek at the new gallery, and check back in a week or so to see what has changed, I am sure you will enjoy! I began the tedious task of taking action on my New Years Resolution to spend my mornings on administrative work (like updating my website) and afternoons painting. While there is a daunting backlog of updates to be made, I made good progress on my landing page today. 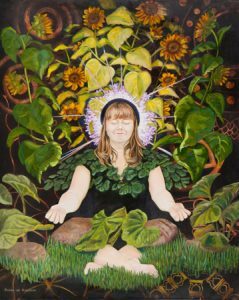 Currently featured on my landing page, Wild Roses is one of my most recently completed paintings, from the body of work that I am painting for the Western Showcase. I am a born and raised Calgarian. In Calgary the biggest annual event is the Calgary Exhibition and Stampede. It is billed as the greatest outdoor show on earth, and the entire city takes 10 days off to celebrate our western heritage. Growing up in Calgary, I could hardly have avoided internalizing a perspective informed by our western heritage. Part of this body of work is looking at what that means to me. In Wild Roses I was thinking about how western themes are typically seen as suitable fantasies for little boys, hence their role models, the Cowboy, the Gunslinger, etcetera, tend to be presented with a masculine face, while females populate the setting of the hero’s story. 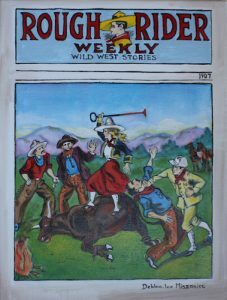 I wondered what historical western female characters little girls might choose to emulate in their heroic fantasies, and what lessons they might have to teach. Annie Oakley was an early western female sharpshooter who made her fame and living performing with Buffalo Bill’s Wild West Show. Growing up she had the deck stacked against her, but through her strong sense of individuality and commitment to her personal strength and vision she rose above her circumstance to become a staunch advocate for female independence, and someone worthy of inspiring a new generation of western women to create their stories on their terms. Author DebbieleeMiszaniecPosted on January 7, 2017 January 6, 2018 Categories The Story Behind the Painting, What's the Big Idea? It’s that time of year that we are all looking to the future and deciding what we want that to look like! For many of us, myself included, that means resolving to lose the 10 pounds we put on over the holidays. Clear clutter, get organized, take care of finances, focus on family, all great personal resolutions. But what about our career resolutions? That is not just something for people in offices looking for raises and promotions, it is for us creative types too. I propose using your resolutions as career planning tools. What has not worked in the past year, and what are you going to do about it? What do you want to do more of? What new projects look interesting and how can you get started on them? For my resolutions, first of all I should let you know that I am still working on the last painting for that deadline which is fast approaching, this Thursday to be precise. It was not my intention to be pushing this close to my deadline, I had wanted this all done by mid December so I could enjoy the holidays without stressing over work. However, life and personal commitments got in the way and here I am stressing. SO, my first resolution, since this is an annual deadline, is to start on the paintings for next year ASAP. Next week I will work on tying up lose ends such as website and bookwork, and a couple small painting projects left hanging until this was out of the way. January 16th 2017 I will begin the paintings for the 2018 deadline, to be completed by March 31st 2017. Next resolution: I have found that I am quite behind on my website updates, newsletters, proposals and applications. I was watching a video on youtube of Paul Klein talking about what it takes to be successful as an artist. One of the things he mentions is spending AT LEAST 30 percent of your time in your creative life on the marketing and administrative end, as opposed to the actual research and art making side. That sounds like a very useful piece of advice for me at this time, so for the next year I resolve that during studio days my mornings will be devoted to the ‘office’ side, and my afternoons to the ‘studio’ side. So, there are a number of other things I would like to see happen this year, however, I think these two actions should make such a significant difference in how I look back at 2017 come next New Year, that I may find that a few of those other things actually come about because of these resolutions. So here is to a happy, productive and successful 2017!